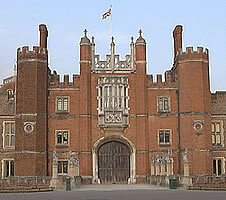 This page introduces the members of the British royal family, as well as their palaces and royal ceremonies. Queen Victoria (1837-1901); King Edward the Seventh (1901-1910); King George the Fifth (1910-1936); King Edward the Eighth (1936); King George the Sixth (1936-1952); Queen Elizabeth the Second (1952-present). Queen Elizabeth the Second was born in 1926. She is the current head of state for the United Kingdom, and also head of the Commonwealth, a group of countries which used to be part of the former British Empire. She will celebrate her Diamond Jubilee (60 years as Queen) in 2012. She is a member of a royal family line known as the House of Windsor. Both the Queen's sister (Princess Margaret) and her mother (known as the Queen Mother) died in 2002. The Queen is married to Prince Philip, whose title is the Duke of Edinburgh (not King). The Queen's eldest son is Prince Charles (born in 1948). His official title is the Prince of Wales. If he becomes king, he will be known as King Charles the Third. He was married to Princess Diana, but they divorced in 1996. Diana died in a car accident in Paris in 1997. 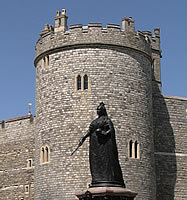 Prince Charles' partner, Camilla, married him in a civil ceremony in Windsor in 2005. Camilla is now known as the Duchess of Cornwall, and when Prince Charles becomes King she has asked to be known as the Princess Consort (not the Queen Consort). Charles has two sons: Prince William (born in 1982) and Prince Harry (born in 1984). 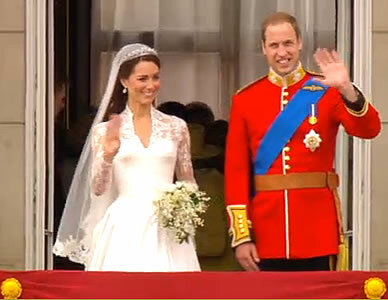 William married Kate Middleton (more formally known as Catherine) on 29 April 2011 in Westminster Abbey, after which the couple are called the Duke and Duchess of Cambridge. If Prince William becomes king he will be known as King William the Fifth. The Queen has three other children. Princess Anne has the title of Princess Royal. Prince Andrew is the Duke of York. Prince Edward is the Earl of Wessex. 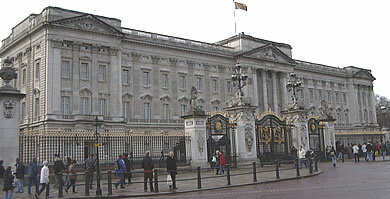 The main home of the Queen is at Buckingham Palace in London. She spends April and the second week of June and many of her private weekends at Windsor Castle (see: Travel/Tours/England/Windsor). 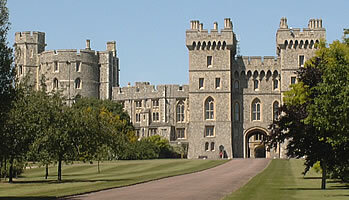 Other official residences are at Sandringham in Norfolk and at Balmoral in Scotland. The Queen is protected by soldiers from the Household Division. The soldiers on foot wear a black bearskin hat. 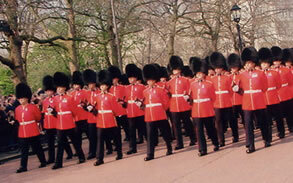 They are known as the Foot Guards: there are 5 different types (Grenadier Guards, Coldstream Guards, Welsh Guards, Scots Guards and Irish Guards). The soldiers on horses wear a pointed helmet and are known as the Household Cavalry: the Life Guards wear white in their helmet, and the Blues and Royals wear red. There is a regular ceremony at Buckingham Palace known as the Changing of the Guards. 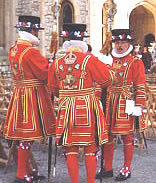 The Yeomen of the Guard can be seen at the Tower of London: their duties are mainly ceremonial. The Queen attends many events and official occasions both in the UK and abroad, and supports the work of many charities. Each June there is a ceremony to celebrate her "official" birthday (not her real birthday), known as Trooping the Colour (see: Ideas/Album/TroopingTheColour). Soon after this there is the Garter Day ceremony in Windsor Castle (see: Ideas/Album/GarterDay): a tradition dating back to 1348. In November she takes part in the ceremony which pays tribute to those who died in wars on Remembrance Sunday (see: Ideas/Album/RemembranceSunday). Another official duty is the State Opening of Parliament in October or November (see: Ideas/Album/StateOpeningOfParliament). 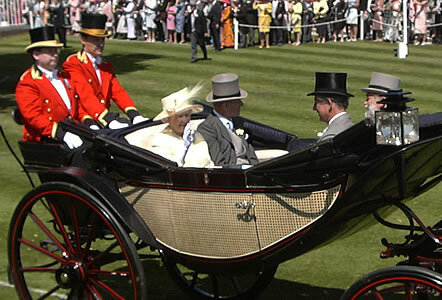 In May and June she likes to attend the horse racing events Derby Day (see: Ideas/Album/DerbyDay) and Royal Ascot (see: Ideas/Album/RoyalAscot). The Queen's official website: http://www.royal.gov.uk. Prince Charles' official website: http://www.princeofwales.gov.uk.